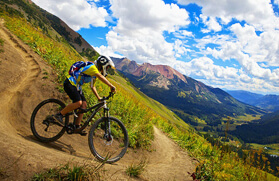 Mountain biking in Himachal is certainly a popular sport especially among adventure enthusiasts. It will take travellers through many remote villages and valleys. 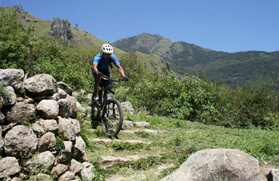 One can travel through the hard grounds that are best meant for mountain bike travellers. 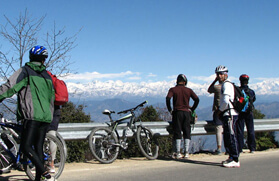 Biking is a great way to enjoy the picturesque attractions and natural beauty of Himachal Pradesh. 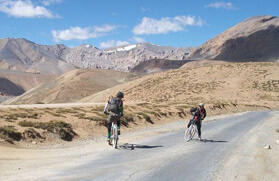 If you want to have this kind of adventure added to your life, then Mountain Bike Tours in Himachal offered by Trekking in India can best suit your needs. 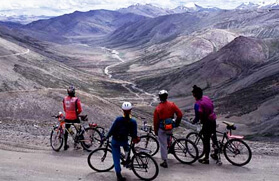 Trekking in India offers an exciting Mountain Bike Tours in Himachal for 15 days that can take you around some major attractions of Himachal. Our tour will start from Delhi to Shimla via Chandigarh. From here you will visit Thanedar - Sarahan, Sangla - Kalpa, Pooh - Tabo to Kaza. You can visit Ki Monastery in Kaza. Further continuing with the journey, you will visit Losar, Gramphoo - Manali and come back to Delhi. You will pass through many remote villages, small towns, old palaces and monastery. Also on the way, you will witness the beauty of high mountain peaks and beautiful valleys offer a stunning landscape. 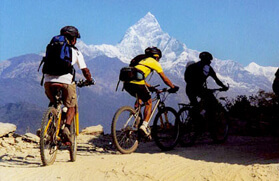 Mountain Bike Tours in Himachal is best to take a break from the daily stressful and boring life. It can help in adding some fun and adventure to life and experiencing some unforgettable moments in life. 80 kms from Shimla on the old Hindustan-Tibet road lays Kotgarh, which enjoys a special place in Himachal history. In 1916 Samuel Stokes, a social worker from Philadelphia brought the first apple saplings to Kotgarh, the place he adopted as his home. One can still see the 'Starking Delicious' apple orchard that he planted there. Overnight stay in tent. For six months every year, the Himalayan valleys of Kinnaur and Spiti emerge from a thick cloak of snow to reveal a different, secret world to man. Your discovery of the lesser - known Himalayas can begins in the Sangla Valley. Overnight stay in tent. We enter the Spiti valley today. The terrain will leave you breathless and speechless. From lush green valley of Kinnaur, we move to rock-hard cold desert mountains, torrential rivers and icy cold winds that account for the sparsely populated villages. At a height of 10,500 ft this high altitude desert is home to the second most important Buddhist monastery in the entire Himalayan region - the Tabo Gompa. It is now 1008 years old and is rumored to be the place the Dalai Lama will finally settle in. Kaza is the capital of Spiti Valley. Rudyard Kipling describes Spiti in "Kim" in these words: "At last they entered a world within a world - a valley of leagues where the high hills were fashioned of the mere rubble and refuse from off the knees of the mountains... Surely the Gods live here. Ki Monastery is a Gelugpa sect monastery. Its hilltop position points to a post-thirteenth century construction. The three storied structure consists largely of storage rooms at the bottom level while the middle floor houses the Dukhang - the assembly hall - and the uppermost floor has another temple and head Lama's quarters on the one side of an open terrace. The greatest wealth of Ki Gompa lies in its collection of 'Thangkas' salvaged with difficulty from the devastating raids of the Dogars and the Sikhs in the 19th century.